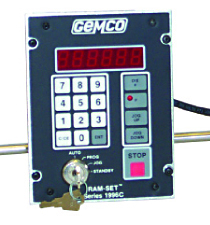 The 1996 Series Ram-Set™ Press Shut Height Controller is a dedicated stand-alone system which automatically positions the press shut height to a customer predetermined location. By consistently repositioning the shut height to a known “good” value each time a die is changed, hit-to-hit times will be greatly reduced, thus saving scrap and time. Other features include relays to interface existing ram adjust up/down motor starters as well as run/interlock circuitry. An additional relay monitors the shut height position once it has been driven to a “good” value. The relay stays energized as long as the shut height stays within a programmed +/- window around the setpoint. If the slide “drifts” to an unacceptable value the relay will de-energize, which could be used to stop the press. exact shut height for that die. • Absolute Linear Position Feedback to .001"